"This is bad, JinJin... THIS SORTA QUALITY IS REALLY EXPENSIVE RIGHT?!" 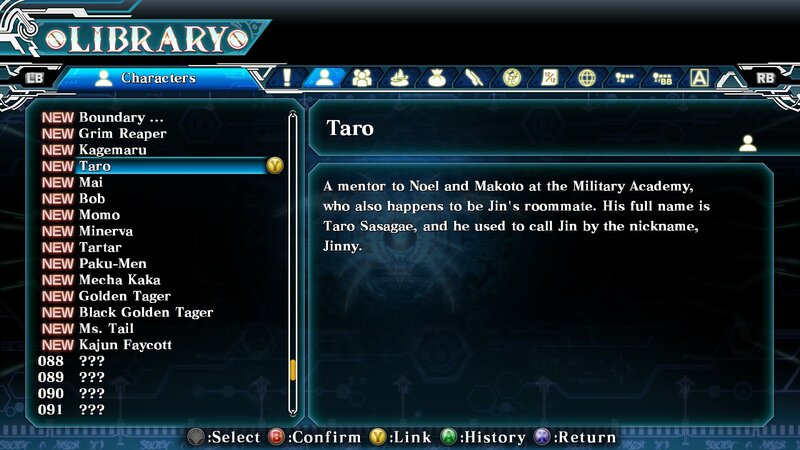 Taro Sasaga'e (タロ＝ササガエ) is a close friend of Mai Natsume, Jin Kisaragi, and Akane Teruhiko. He was Jin's bodyguard during his days at the Military Academy, and is a member of the Mutsuki family. He fights using Ars Magus threads, and stays loyally by the sides of both Jin and Mai. Taro first debuted in BlazBlue: Remix Heart. Taro is a tall young man with dark skin, red eyes, and messy black hair. He wears an olive green jacket over his shoulders, never wearing it properly, and has a white shirt with numerous patterns near the collar. Taro also wears jeans, standard shoes, and black gloves with which he controls his Ars Magus threads. In the Military Academy, Taro dressed nearly identically, except he wore his uniform over his shoulders and had a striped belt. He wore numerous white shirts with different logos on the front. Initially, Taro may seem naive and slightly dim-witted, but he has a gentle heart. Taro cares for everyone around him, and will do anything to protect them. He can get easily distracted, however, and has been known to feign ignorance, being much smarter than what others may credit him with. He cares greatly for Jin and especially Mai. It's heavily implied that he has romantic feelings towards the latter. Taro is adept in the use of Ars Magus threads, using them to ensnare opponents. His fighting skills are enough that he managed to protect Jin from numerous assassins from his time in the Academy without either him or Akane properly noticing. He also knows an Ars that allows him to erase a person's weight so he can carry them long distances. He has to wear special gloves when using his threads. Although he is comfortable with the Ars that he fights with, Taro can be naive and doesn't know some simple Ars, like one used to open sealed letters. A mentor to Noel and Makoto at the Military Academy, who also happens to be Jin's roommate. His full name is Taro Sasaga'e, and he used to call Jin by the nickname, Jinny. A third-year in the upper division of the NOL's Military Academy. Jin's roommate. In the BlazBlue 10th Anniversary Character Poll, Taro placed 37th out of the 84 candidates. He scored one place above Trinity Glassfille and one place below Carl Clover. He had 504 votes. Sumeragi, the illustrator of BlazBlue: Remix Heart and BlazBlue: Variable Heart, has stated that she designed Taro to be, aesthetically speaking, her "ideal man". Taro was not originally supposed to be related to Kagura. It was only after Sumeragi commenting on his likeness to Kagura while speaking with Toshimichi Mori, the series creator, that the latter made them related. Taro has been mentioned three times in the series. First was in BlazBlue: Chrono Phantasma when Noel Vermillion and Makoto Nanaya noted his disappearance. He was also alluded to by Kagura. In Chrono Phantasma Extend, Taro was mentioned by Kagura when he talked about Jin's academy days. Finally, Taro was mentioned in BlazBlue: Central Fiction by Mai if she wins against Kagura. By the time of Central Fiction, Taro's whereabouts are unknown by Mai. This page was last edited on 19 February 2019, at 23:57.